“It’s time to go back to Square One.” This is a phrase we often throw out when a horse has developed undesirable behaviors, or the handler has lost all authority and control of the horse. But like many things in horsemanship, it is far easier said than done. Getting back to basics or going back to square one in your training may mean different things to different people, but to me it means starting at the beginning—the most basic level of training. When a previously well-behaved and well-trained horse goes rogue, it often stems from poor leadership and poor handling on the human side of the equation. Perhaps it has escalated into rude, disrespectful or even aggressive behavior from the horse, but it started with the actions of the human. Sometimes, a horse that is poorly behaved on the ground was never really taught proper behavior, or worse, was inadvertently taught to do the wrong things. Either way, we must go back to the beginning and re-establish rules of behavior, ground manners and our expectations of the horse. In most clinics that I do, there are a handful of horses that fit into this category. For whatever reasons, the relationship between the person and the horse is contentious. Sometimes this results in a horse that is indifferent to the owner—ignoring her requests, walking all over her and paying attention to everything around him except the handler. 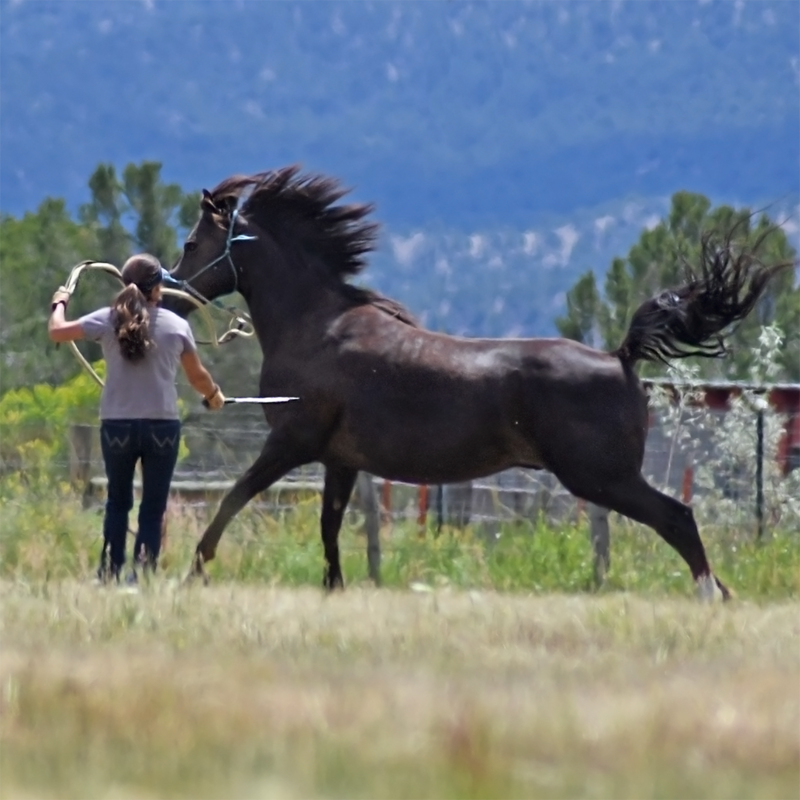 But when this condition persists, it can result in a horse that becomes disdainful of the handler and may act out in aggressive or volatile ways. While the behavior of the horse definitely needs to be addressed, unless the person changes the way they handle the horse, retraining the horse is futile. Whether a horse is untrained (has never been taught how to act) or is poorly trained (has actively been taught the wrong things), if he doesn’t learn proper manners, he may become unpleasant and unsafe, in short order. Horses are herd animals that know how to get along, know how to follow rules, and know how to respect authority. It is up to the handler to set the rules of behavior for the horse and provide the leadership the horse needs, in order to respect the authority. If I am taking a horse back to square one in ground handling, there is a very clear progression I would take, starting with the most critical issues and progressing to complete mind and body control; sussing out the holes in the horse’s training and filling them in before moving onto the next thing. Turning a horse into a model citizen and one that’s pleasant and safe to be around, doesn’t happen accidentally. It comes from systematic training, consistent reinforcement and high expectations. My first concern, if I am handling an unruly horse from the ground, is always about me and my space. Does the horse have deference for my space? Will he move out of my space expeditiously when I ask? After a lifetime of handling horses, I’ve learned to be very clear on this subject with any horse I handle. If he moves any part of his body (nose, shoulder, hip) toward me, I will address it immediately. Most horses that I handle learn to respect my space very fast. I am VERY protective of my space. If you’ve met me face-to-face, you may have noticed that I am not very big. The last thing I want to do, is be around a horse that is moving into my space or slinging his head and shoulders toward me. Generally, within a few minutes, the horse I am handling becomes very clear on my boundaries. You must define your space (for me, it’s as far as I can reach around me, with my arms outstretched), and make it clear to your horse where the boundary is. Horses are very good at understanding space; people are not very good at defining and defending their own boundaries. Horses can be very clever about invading your space in subtle ways, so be diligent. The next step is to make sure the horse yields to your space—meaning he backs away when you move toward him. He moves respectfully out of your bubble when you move your bubble closer to him. He shows concern about where you are and is careful not to come too close to you. Once you are in control of the horse’s space, you will know it. The horse will have deference for you then. He will watch you and be concerned about what you are doing and whether or not he should react in some way. I have no interest in moving forward with a horse’s training, until he shows some deference and has some respect for my authority. The next thing I need my unruly horse to learn is that I control where he goes and how fast he gets there—not him. This is a critical step in ground handling and it will carry over in a big way to mounted work too. In both instances, we need the horse to understand that he doesn’t get to do whatever he wants. Trust me, you don’t want a thousand-pound flight animal thinking he has a choice over where he goes and how fast he gets there! To show the horse that I control direction and speed, I simply need to change direction and change speed a lot. In the round pen, this would mean turning the horse around frequently. I am very particular about which way the horse turns—starting with the outside turn (turning away from me), to emphasize him moving out of my space. If I am working the horse in-hand, from a lead line (using at least a 12’ training lead, and preferably a 15’ lead), I’ll be turning the horse away from me (turning to the right if I am leading form the left), making sure his whole body is moving away from me in the turn and not just his nose. A critical concept to remember in horse training is, every time you change the direction of the horse, you gain more authority. Once the horse understands that I control his direction, I want to start altering his speed. I’ll walk slowly, making sure the horse alters his speed to match mine; then walk faster, making sure the horse makes an effort to catch up. Another critical concept to remember in horse training: all of training occurs in transitions. The more I ask for changes of speed, the more responsive the horse becomes. With the previous two steps, I gained deference from my horse and established control of him. Now it’s time to teach him how I expect him to act around me. My herd; my rules. Horses are very good at learning and following rules, because that is what herd life is like. When rules are clearly defined and consistently enforced, horses learn the rules fast. If it is a trained horse I am dealing with, one of the first rules I will teach the horse is, “Don’t move your feet unless I tell you to.” I teach him to stand perfectly still, like a statue, when I ask him to. To me, it’s not enough to make the feet of the horse move. I must also be able to make them hold still. Moving the feet of a flight animal should not be hard; but making them hold still can be a challenge sometimes. The second rule of behavior I teach the horse is, “Keep your nose in front of your chest at all times I am around you.” No looking around. No moving your nose toward me (you’ll never have a horse that bites if you never allow him to move his nose toward you). When a horse is busy looking around, he’s looking for a way out or for something to react to (or he’s just being a busy-body). Either way, he’s not paying attention to me. If he’s looking for a way out, he’s telling me he’s not there for me. I need him to know that leaving is not an option. In short order, a horse I am handling learns that he has two choices: focus on me or focus on nothing. Once these more fundamental expectations are made clear, I move onto more of a refinement level of training from the ground. I’ll work on the horse’s leading manners, making sure he is vigilant about my space, that he rates his speed off me and that he turns well and never leans his shoulder into me. We’ll also work on standing tied, quietly and patiently (lots of time at the “patience post”), feet handling, trailer loading and tacking up. This kind of “back to basics” training can transform a horse rapidly, if the handler has good training skills. A trained horse that has learned to act poorly because of bad handling, will respond in just minutes when faced with a skilled trainer and competent leader. An uneducated horse will learn proper manners with just a little more time and will become a model citizen fast, when handled consistently in this way. The specific training techniques I would use to accomplish these steps are clearly detailed in my two training videos, Round Pen Reasoning and Leadline Leadership (available both in DVD and VOD). The mechanics of your training are very important—the progression, the techniques, the response of the horse. You must use clear and consistent cues, with effective reinforcement and appropriate amounts of discipline and praise. When you do, the horse responds rapidly. Just as in the case of spoiled, poorly behaved children– it’s the parent and not the child that should be blamed for the poor behavior– the same could be said of poorly behaved horses. Either they don’t know how to act and are acting in a way that seems most appropriate to them, or, they’ve been inadvertently taught to act the wrong way (sort of like giving a lollipop to a child that is throwing a fit in the grocery store). Ultimately, the way a horse behaves is a reflection of his handler. Going back to square one in your ground training, should result in a happier, more compliant horse. Before I move on to addressing training under-saddle, I want to make sure all these steps have been accomplished. And when they are, we’ll move onto “Back to Basics” in our mounted work.